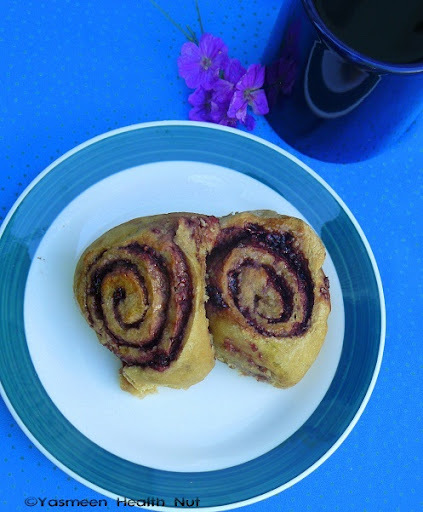 Who does not love fluffy sweet cinnamon rolls?.These classic rolls presented here are lower in sugar and fat calories and intensified in flavor with the wild blueberry filling. I always keep an eye out for the frozen Wild blueberries in the freeze aisles of stores,for 2 good reasons ,first these are rarely sold fresh and said to be equally good when frozen.Second for its super antioxidant benefits. Wild Blueberries (vaccinium angustifolium) are distinct from their cultivated cousins in several significant ways. Unlike cultivated (highbush) blueberries, Wild (lowbush) Blueberries are not planted. They are spread primarily by rhizomes or underground runners, which give rise to new shoots and stems. Wild Blueberry fields and barrens contain many different varieties of berries, which accounts for the variations in size and color that characterize the Wild Blueberry crop. Wild Blueberry growers use many modern crop management techniques to carefully tend their fields and encourage growth. * Antioxidant capacity - Wild Blueberries contain more of the powerful antioxidant anthocyanin and demonstrate greater antioxidant capacity per serving than cultivated blueberries. * Size - Wild Blueberries are naturally smaller and more compact (less water content) than cultivated, which means you get more Wild Blueberries per pound. * Performance - Wild Blueberries hold their shape, texture and color through a variety of baking and manufacturing process. They also freeze very well: IQF Wild Blueberries maintain their quality for more than two years. A dull ,breezy and rainy day marred the weekend fun,baking these rolls brought the warmth back.Fresh baked rolls brightens our weekend brunch every once in a while,I have tried and loved a variety of fillings.The first 3 pictures is of when I baked them last winter and the bottom of one I baked yesterday.My cherished flavors are any kind of tart sweet berries like cranberries,raspberries or black berries ,that taste just as good as the wild blue berries. Dissolve the yeast in warm water, stir in the sugar and allow the yeast to get frothy, about 10 minutes.In a large bowl combine the flour and salt .Add the yeast mixture and olive oil and knead until supple and smooth.Apply some more oil on the sides of the bowl cover and allow to rise until double it size about 1-2 hours. 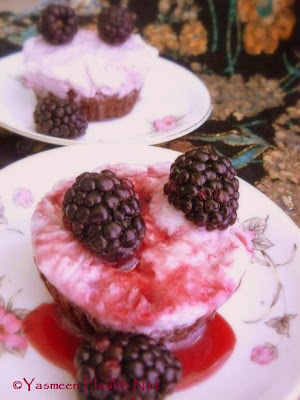 In small sauce pan,mix the berries and sugar,and cook until soft and mushy,6-8 minutes on medium heat.Dissolve the cornstarch in tablespoon of water and stir in the blue berry mixture and cook another 3-4 minutes until thickened.Sprinkle the cinnamon and stir to combine.Cool before spreading in the rolls. Place rack in center of oven and preheat to 350F.Grease a 8 inch round pan with cooking spray. Flatten the dough in to a rectangular shape using a rolling pin,spread the blue berry filling evenly,leave the edges of the dough.Roll the dough tight,place the seam side down and cut in to 8-10 rolls using a sharp knife. Place them in the prepared baking pan about an inch apart.Cover with kitchen towel and allow for rise for an hour. Bake for 35-40 minutes until golden brown and puffy.Drizzle all over with agave or honey as soon you get them out.Let cool for few minutes before serving with a warm cuppa. Cant take my eyes from those beauties, truly tempting and terrific..
Yummy cinnamon Rolls Dear..great pictures..
Yas, I'm hosting an event for June..Please drop on at my blog to know the details..I'm waiting for your healthy entries.. I have some frozen cranberries sitting in my freezer and so I'm so glad you posted this! I think I see some cranberry cinnamon rolls in my future. You always have the best ideas. Yasmeen, these are so beautiful- very striking. I love the colours! 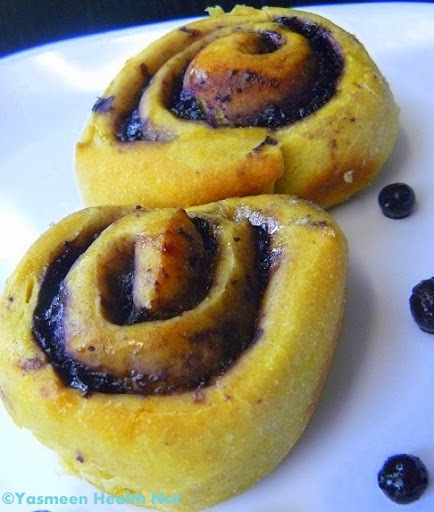 The cinnamon buns looks so soft and delicious with blueberry filling. 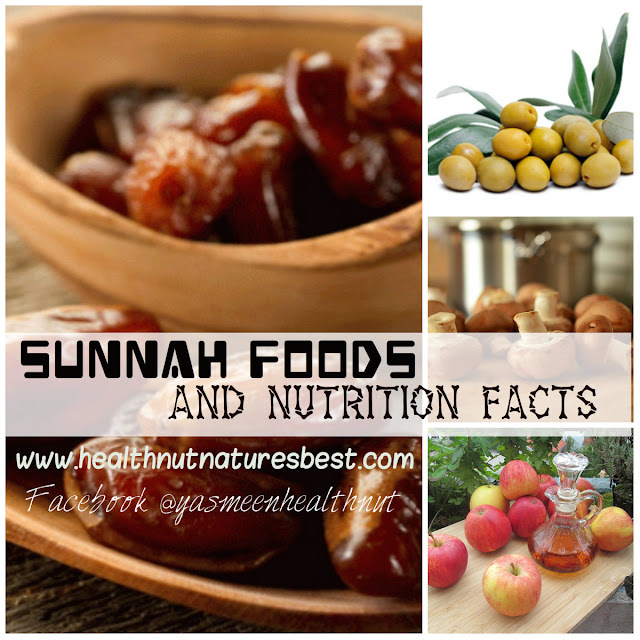 Never tried with the whole wheat ..interesting and healthy one thanks yasmeen. That is a great filling! Your rolls are extremely tempting! Wild bluberry cinnamon rolls looks perfect i love the color. 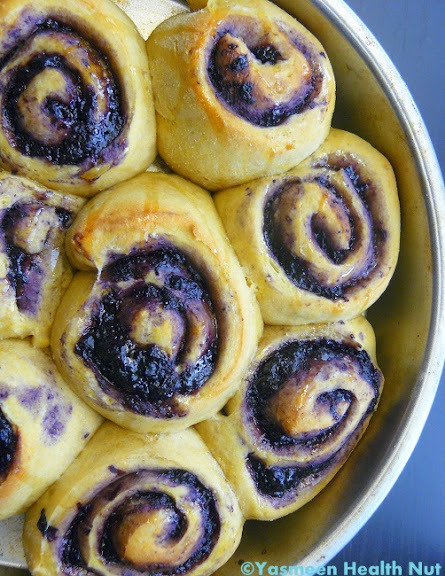 Yasmeen these wild blueberry cinnamon rolls look very delicious. i so badly want to make and have them right away but the problems are yeast and blueberries. perfect and delicious. 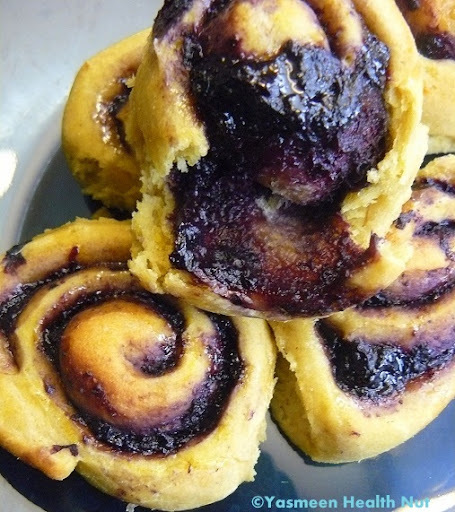 Love the uncommon blueberry filling in these cinnamon rolls. Bravo! These blueberry cinnamon rolls truly scream wild! They are so zany and beautiful. so delicious and healthy!! Can i use the readymade phyllo dough? Wow, that is the only thing I can say !!! Simply lovely and delicious looking Yasmeen !!! Nice twist on cinnamon rolls. Nice innovative thinking. YUM! What a great combo, Yasmeen. Beautiful to look at and I'm sure they taste even more amazing than they look. Gorgeous color and I love the addition of fresh or frozen Blue Berries, looks perfect. 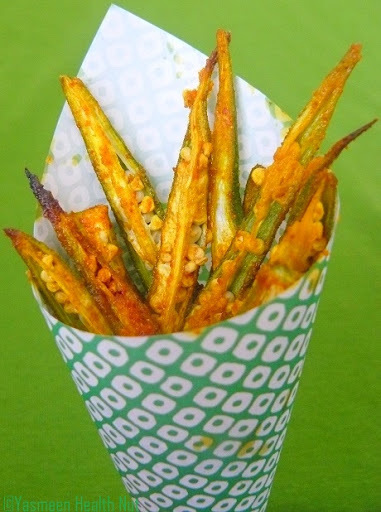 these look so scrumptious yet healthy! great post, yas! Looks wonderful with a delicious filling..great combo. These bluberry cinnamon rolls look so attractive! Yasmeen, you dazzle me with your creations. Such a beautiful and eye pleasing combo! I like the color! So yummy looking, too! Yet I find it so heavy! My diet will be ruined. These look incredible! The bakery I worked at used to do a blueberry cinnamon bread and I completely forgot about it until seeing these. Such a great combo! I need to try these. I would go for any kind of berry filling,so yum! I like to pick blueberries in the woods around at this time of the year. I like the idea of filling rolls with them so the next time I pick some I now what I will cook with them! These look wonderful and I can just imagine how they taste! We read the health news on these awhile back and my boyfriend bought bags and bags of frozen berries. I've been using them in everything. I even made frozen yogurt popsicles! Now you've given me another way to use them up!! !